The Animal Sounds app has been updated to version 2.0 adding support for two new animals, and now supports users of both BlackBerry 10 and Android. This is a simple app that plays back the sound made by various animals. From horses to dogs to cows, this app includes a variety of animals that will make a sound when you tap on their picture. Version 2.0 of the app adds both a monkey and a whale to the list of recordings that the app can play back. 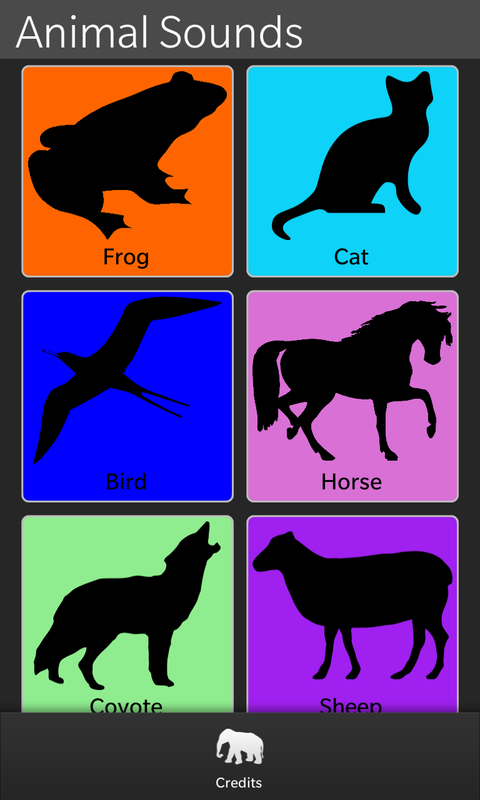 The free Animal Sounds app has been updated to version 1.2 in BlackBerry World. This update reduces the size of the app, adds support for a swipe-down menu, and improves the app’s support for the higher resolution of the BlackBerry Passport. This is a simple app that plays back the sound made by various animals. From Horses to Dogs to Cows, this app includes a variety of animals that will make a sound when you tap on their picture. The Animal Sounds app for BlackBerry 10, has been updated to version 1.1 in BlackBerry World. This new version adds support for the soon to be released BlackBerry Q10, as well as adding precautions to prevent accidentally triggering any of the animal sounds. 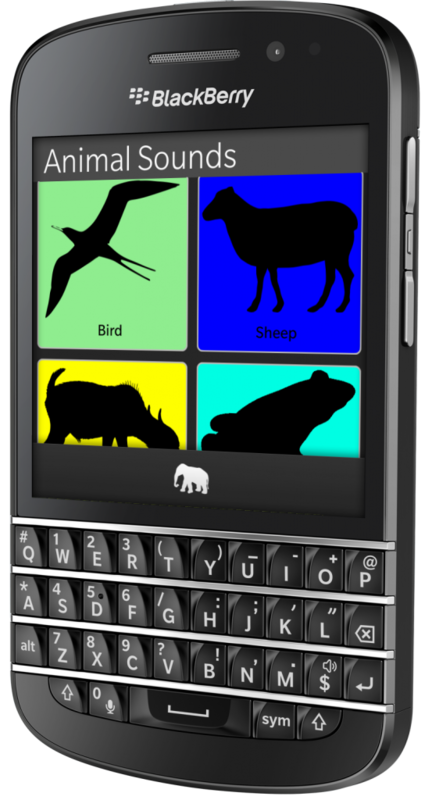 Animal Sounds is a brand new free app for BlackBerry 10 that has just launched. The app allows you to click on an image of an animal, and hear what sound that animal makes. This app was originally created as a challenge to myself to create a brand new app in less than 24 hours. In the end, I finished it in less than 12. The details of this process have been documented at Storify. Over the past few weekends BlackBerry has hosted some port-a-thon events in which they offered $100 for every BlackBerry 10 app submitted to BlackBerry World. I placed quite a few apps into the store during these weekends, but for the most part they were apps that I would have been working on anyhow, and mostly apps that I had already had up and running on the old BlackBerry OS. To be fair, developers such as myself were not the primary target for the event, but it did encourage me to create three more apps for the launch of BlackBerry 10 than I otherwise would have. The animal sounds app was mainly done as a challenge to see if I could complete an app in under 24 hours. The port-a-thon was mostly just an excuse to jump in and do so. It also provided a revenue model for the app. I knew going in that the app would not be good enough, that I could charge for it, and placing advertisements in apps aimed at kids has always struck me as being a bit sketchy. One hundred dollars easily was enough to cover the minimal effort that this app took. 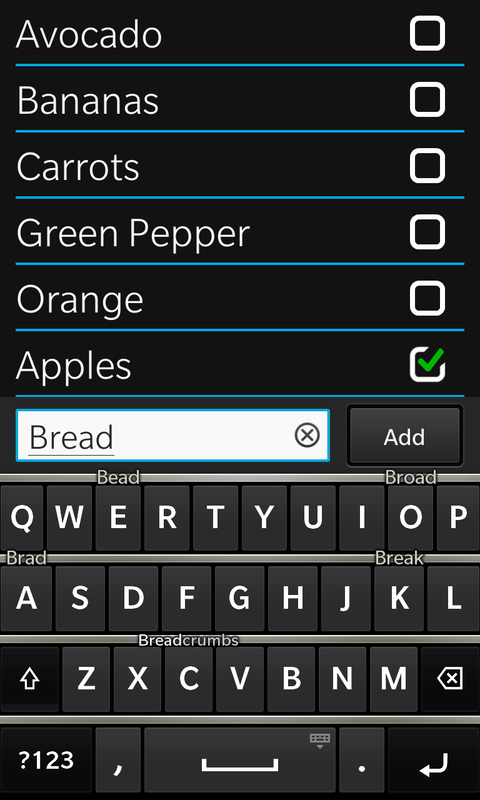 I also took the time to turn this blog into an app using the BlackBerry App Generator. In many ways this was just an excuse to try out the tool. Given that there is no way to actually test these apps on device before submitting them to AppWorld, I am still not sure what I am going to do with this app. Depending on how this app turns out, I may remove this one from the store. Given the lack of a good simple grocery list app, it was probably inevitable that was going to write the Stuff I Need app sooner or later. Still the port-a-thon gave me a reason to jump in and write this about a month earlier than I otherwise would have. While this is not a huge app, it is one that I expect to find useful. After proposing to create an app in 24 hours this weekend, I instead finished the app in after only 12 hours. The steps taken are presented below via Storify, which was apparently not designed for this use case. From now until midnight tomorrow, BlackBerry is offering $100 for every BlackBerry 10 app that is submitted to AppWorld. Currently I am on track to have nine applications available in AppWorld at launch. Given that it would be much cooler to have 10 apps for BlackBerry 10, and that I can get a bonus if I finish an app by tomorrow, I have decided to challenge myself to completing a new app within the next 24 hours. I have an idea for a free app that should be fairly simple, but I have not yet started on it at all. And while this idea will require a bit too much time editing images (and audio), I think I should be able to get it completed by this time tomorrow. I will post an overview of this app making experience early next week.